“The starship Dormire is headed to colonize an alien planet, and it is crewed by criminals. In a future where cloning and mind-downloading are commonplace and carefully regulated by law, it is possible for a small crew of six to manage the day-to-day details of the ship’s journey, life after life. It’s not a terribly attractive job, but it is one certain criminals are willing to accept in exchange for the promise of a clean slate at their destination. To help start their new lives, their past crimes are to remain a secret. 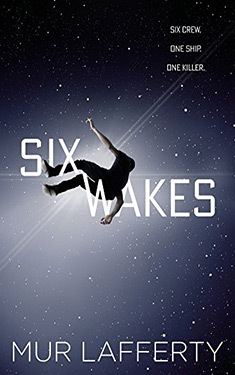 The future society of Six Wakes is shaped by cloning and mind-uploading technology. I personally tend to like books that focus on these sorts of ideas, and in this case I enjoyed how it was carried through to consider legal and social ramifications. Also, I like stories that play with concepts of self and memory, so I found the premise--a mystery where any of the victims might unknowingly be the killer--deeply compelling. I say all this to point out that I was predisposed to like this book (and I did like it!) but I also felt the prose was a little weak. Occasionally, I would be distracted from the story by repetition or awkward phrasing, and there was a kind of sameness to the dialogue of different characters. The story and the world was a lot of fun, and for me, that was enough. The story was split between present and past, the situation on the Dormire and the circumstances that brought each of the characters there. In the present, the stakes are raised through the loss of the ship’s cloning capability. If the characters are killed again, they will not be able to take another try at solving the mystery. This made the story pretty tense and paranoid, and in some cases information is withheld from the reader. The past stories are more of an exploration of the various ways things can go wrong in a world where minds are programmable and bodies are replaceable. It was in these backstories that I got to know each of the characters and their motivations, and this was also where I saw the most of the future society they inhabited. While the situation on the Dormire was certainly interesting, I was more drawn in by the backstories. Part of this might just be because I like world-building, and there’s more of it to see on a world than in a spaceship. I think another part that it is hard to simultaneously establish six compelling characters in an amnesia situation, where they are all also hiding everything about themselves beyond their basic personalities. In any case, it made it difficult for me to build emotional connections with the characters. It was the backstories that fleshed them out, showing us who they were and what they were capable of. As I saw more of the past, it became easier to understand and connect to what was happening in the present. Also, there were some interesting twists near the end, and I was pretty satisfied with how things concluded. Mur Lafferty’s Six Wakes includes a lot of ideas I am drawn to in science fiction literature--cloning, mind-uploading, and related issues of self when personalities can be described in code. I enjoyed seeing ideas of how the introduction of these technologies might change human society. The story was really fun, but there was some weakness in the writing that was a little distracting. Rather than the spaceship murder mystery, I was more interested in reading about each character’s background and the cloning-related problems they’d had in their lives. Overall, it was an entertaining book, and one that I am happy to have read. “Juza Unno, the father of Japanese science fiction, wrote a great number of stories in the 1930s and 1940s which contained exceptional elements of science and technology. 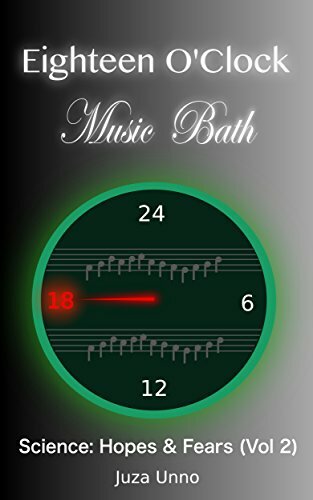 Eighteen O’Clock Music Bath, one of his most well-known works, is a dystopian novella set in a future where humanity has obtained eternal life and the freedom to do almost anything–except for a single hour a day, where citizens must perform the most important societal tasks with superhuman productivity. This is the second volume of the work of foundational Japanese science fiction author Juza Unno, translated by J.D. Wisgo. I have reviewed the first volume here, and if you’re interested in this second novella you can find it on Amazon here. These works came to my attention because my brother was involved in the translation work for this book, and I think it’s an exciting opportunity to read some of the earliest Japanese science fiction. Since this is an older work that I am reading far out of its time, I will discuss but not rate the novella. These days, dystopian fiction has become pretty popular. Juza Unno’s “Eighteen O’Clock Music Bath” may have been written over 80 years ago, but it presents some basic themes that have been presented time and again in stories since. The government is obsessed with controlling its citizens, mind and body, and they do so through new technology. 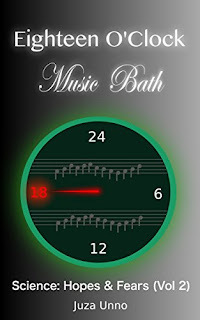 The “music bath” is a method through which citizens can be both focused for an hour of superhuman productivity (for government-approved work, of course) and be forced to adhere to the ideals of the government for the rest of the day. The experience of the bath is actually deeply unpleasant to the citizens, and can even damage their brains from long exposure. To the president, this is a small price to pay for a docile, productive, crime-free populace. The president does not see humanity as a necessity in his subjects, only loyalty and obedience. There is some conflict set up between the scientists and politicians, but Unno does not seek to portray either in a particularly positive light. Initially, scientists are preventing the politicians from totally cooking the citizens brains, but the scientists are also the ones who made the music bath possible in the first place. The story was much more balanced in gender than I would’ve expected from such an old work. There are about the same amount of male and female characters, and two scientists are even a married couple. In addition, there’s some surprisingly abrupt transgender content, which some of the characters approve of and others revile. In general, this novella was not exactly what I expected for the time period, given my experiences with contemporary English works. It was really interesting to read a vision of a future dystopia imagined from historical Japan, and I wonder if the struggles of the era influenced the ultimate bleakness of the ending. ”A power-driven young woman has just one chance to secure the status she craves and regain priceless lost artifacts prized by her people. She must free their thief from a prison planet from which no one has ever returned. 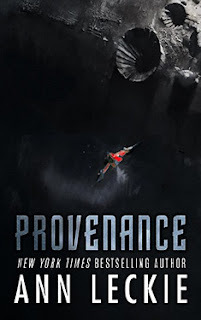 Provenance is set in the same universe of the Ancillary trilogy, but otherwise has very little connection to it. It doesn’t share any characters with the previous books, and it also has a much lighter tone. The plot is full of energy and forward momentum, bouncing between many different kinds of high stakes situations (heists, murders, hostages, etc.). Somehow, all this activity comes together into a coherent story, both in terms of the plot and in terms of the repeated themes. I had a lot of fun reading it. Interesting world-building was a highlight of the Ancillary trilogy, and this book proves that there’s plenty of room for new cultures in the same universe. Leckie here includes the societies of Tyr, Hwae, and Omkem, as well as the alien Geck. The story mostly takes place in Hwae system, so theirs is the culture we learn the most about. A central concern in the novel is the Hwaean obsession with physical representations of their past. This includes not just important political documents, but even things as simple as old party invitations. The importance they place on these objects seems absurd to outsiders, but historical authenticity is an important way to establish status in Hwaean culture. In the other cultures, human and alien, there are also things that make sense within, but seem odd to outsiders. I enjoyed seeing how the different societies functioned, and seeing how they managed (or not) to deal with one another. For me, another strength of the story was the main character, Ingray. She was a child from a “public creche” who was adopted into a prestigious family (perhaps as an act of charity). She’s in competition with her privileged brother Danach to prove herself worthy of the family inheritance, but she doesn’t really think she’s capable of beating him. The story kicks off with her taking a huge risk in an uncharacteristically bold attempt to win her mother’s favor, and the fallout from this gamble propels the rest of the story. I found it very easy to sympathize with Ingray’s anxiety, her self-doubt, and her tendency to become overwhelmed and panicked when things go wrong (which happens a lot). She makes a lot of missteps, but she’s also far more intelligent and resourceful than she gives herself credit for. I am a huge fan of smart protagonists and of flawed protagonists, so Ingray was exactly the sort of person I prefer to read about. On a last note, the word Provenance essentially indicates the basic theme of the novel. Throughout all the action and Ingray’s misadventures, the novel is interested in exploring how the past forms a link to the present, and how it helps or hinders us as we move into the future. This plays out on the societal level in several ways, one of which is the questioning of the benefit and legitimacy of the Hwaean historical artifact traditions. On the personal level, we see this reflected in the lives of Ingray as well as a cast of several memorable minor characters. Ingray’s self-worth is influenced by the knowledge of her “lowly” birth status, and she is also molded by the enforced competition of her family environment. Her past shapes who she has become, but she must also find a way to not allow her origins to define her future. It may be a relatively simple theme, but I think it is still a good one. The end of the story was not entirely a surprise, but it provided a satisfying resolution for each of the characters and subplots.